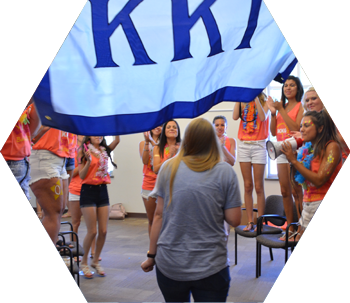 Formal Recruitment takes place the week before schools starts, and is the main process the National Panhellenic Conference sororities at UNM use to seek new members. During recruitment, women will have time to ask questions about sorority activities, financial obligations, new member programs, scholarship, community service, and sorority life in general. Participating in Formal Recruitment does not obligate a woman to join a sorority, nor does participation in the recruitment process guarantee that a woman will receive a bid to join a sorority. Sorority Recruitment is a mutual selection process. There are many opportunities to learn about sorority recruitment before the formal process begins, including New Student Orientation, sorority informationals and receptions, and more. Complete an interest form or register for recruitment to receive the most up-to-date information. For additional information, fill out an interest form. All women interested in participating in the recruitment process must register. The registration process starts in late April and ends on the first day of recruitment with walk-up registration. The cost for recruitment is $40 until August 1st. The fee will increase to $50 following August 1st. To register on-line, visit the following link. Panhellenic recruitment is a mutual selection process, meaning you choose them, and they choose you. Potential new members decide which sorority events they want to attend, and the sororities will decide which women they want to invite to their events. Potential members may not always get invited to the parties they would like to attend, but they will meet with every sorority at least 2 times during the week. Just as each woman deserves consideration from each sorority, each sorority deserves consideration from you. To make the most of the experience, potential members should ask questions and learn all they can about the women in the sorority. You will have personal assistance from helpful women along the way called Recruitment Guides or Rho Gammas. When going through the recruitment process, you recruitment guides will be referred to as Rho Gammas. 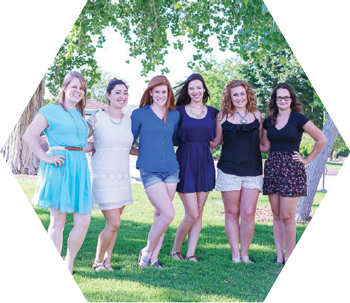 Recruitment guides hold leadership positions within the UNM Panhellenic Council to positively promote sorority life to potential new members (PNMs) before, during, and after the recruitment period. Additionally, they strive to increase interest and participation during recruitment. During the recruitment process, recruitment guides are neutral, meaning they are not directly affiliated with their specific chapters. Ultimately, it is their mission to assist women with the questions and concerns they may face during recruitment week and in their transition to college. Provide support and guidance to women participating in the recruitment process. Encourage women participating in the recruitment process to continue through the entire recruitment process. Stay positive, organized, and always available. Understand the recruitment process, timeline, and rules. As a PNM, you should get to know your recruitment guide and feel comfortable going to her with any questions you may have about recruitment or sorority life. During recruitment, the recruitment guide is your most accessible and knowledgeable resource. In addition to the Formal Panhellenic Recruitment process, there is an informal recruitment process called Continuous Open Bidding (COB) for Panhellenic sororities. This process occurs after the formal recruitment period has concluded. Please note that not all sororities will participate in COB. To register for Fall COB please contact the Greek Life staff. 4:00 p.m. Potential Members meet with Rho Gammas. 4:00-6:00 p.m. Potential members receive Invitations to Membership (at the SUB) New Members will meet initiated members and precede to their respective bid day activities.